The safety and security of every home starts with a well maintained gate. A security gate surely protects you and your family from intruders. It serves as a barrier for unauthorized people intending to enter your house. Just because a gate is one of the most important safety feature of the house, it just follows that it has to be maintained properly. The cost of gate fabrication is getting higher and higher over the years and it would save us a fortune if we learn how to protect it from rust and maintain it's attractive appearance. In our case, repainting the gates has been a yearly routine. It does not only make the steel rust resilient, but it also maintains it's cleanliness and nice appearance. I think this is a lot cheaper than replacing the worn out gate just after a few years. 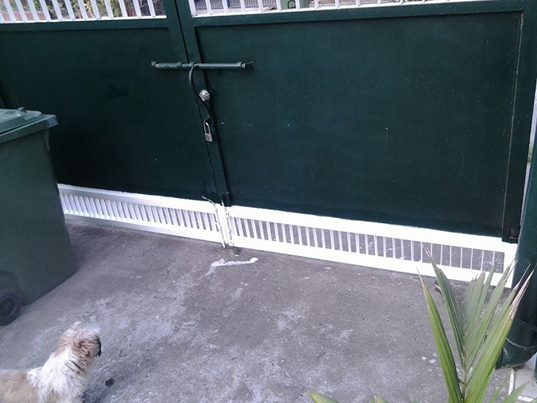 We have a very unpredictable weather in the Philippines and as far as I can remember, wet season is even longer and this really makes steel gates and fences more prone to rusts. You may also want to spray some lubricants such as crude oil to hinges and locks to avoid being stuck. This way, you can prevent squeaky door hinge. Your home is where you should feel safest and most secure, so it is very important for you to take important steps in taking care of things that provide you your utmost security.